Tens of thousands of people from around Europe have marched across Brussels in a protest against spending cuts by some EU governments. Spain has held a general strike, with protesters in Barcelona clashing with police and torching a police car. Other protests against austerity measures have been held in Greece, Italy, the Irish Republic and Latvia. …In Greece and the Irish Republic, unemployment figures are at their highest level in 10 years, while Spain’s unemployment has doubled in just three years. …Police sealed off the EU headquarters and barricaded banks and shops ahead of the protest in Brussels. It was described by unions as a day of action under the slogan “No to austerity, priority to jobs and growth”. Americans may be tempted to smugly scoff at Europe’s troubles, but it’s just a matter of time before the same problems afflict America. 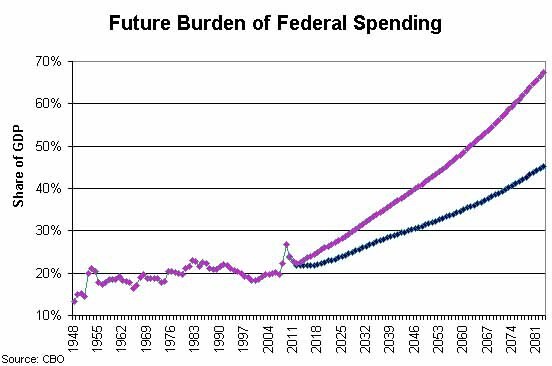 This chart is based on Congressional Budget Office projections (an optimistic “baseline” scenario and a more realistic “alternative” scenario) showing how the burden of federal government spending is about to skyrocket because of demographic changes and entitlement programs. In the optimistic scenario, the federal government climbs to 45 percent of GDP. Add in state and local government, and that means the total burden of government will be about 60 percent of GDP – higher than France, Sweden, and Greece today. In the less optimistic scenario, the total burden of government will be in uncharted territory, perhaps akin to Cuba or North Korea. Needless to say, America will be convulsed by riots well before this point. The solution, of course, is to limit the growth of government. During the Bush-Obama years, howerver, politicians have been heading in the wrong direction. The only bright side, at least for those who feel good when others suffer, is that Europe’s welfare states will have descended into social chaos and barbarism by the time the riots start in America. As a Dutch person I am amazed how many Americans believe this crap. Am I the only one that sees the total parallel of what is happening in America today and over the past 30 years compared to what happened in Germany in the late 1920’s and 1930’s? The Nationalist Socialists eventually controlled the educational system and the media to distort the truth and spread their propaganda of hate. Today the Federally controlled schools are teaching a different skewed version of history than what we were taught. None of the traditional or conservative views to love your country and its heritage are being taught like it was in my time. Now they promote non-traditional view points in the schools systems instead of the traditional views that made America what it used to be. It is also obvious that the media is not reporting the truth but instead propaganda. This propaganda is promoting hate between the classes to help cause social unrest in which more rights can be taken away from the people by the government. The same happened in Germany put is was a racial and social hatred instead with the climax occurring with the burning of the Reichstag in which the government from the top took all control away from the people at the bottom which resulted in a dictatorship. This is just about the same “strategy” for lack of a better word is occurring today. Today with the recent advent of the “Homeland Security” they can name just about anyone a “terrorist” inside the US as well as outside the US. It is just like what the Nationalist Socialists Germans did in the 1930’s to anyone they deemed a threat to spread the truth that was against their propaganda and then they were shipped away. On Oct. 17, 2006, President Bush signed a law suspending the right of habeas corpus to persons “determined by the United States” to be an “enemy combatant” in the Global War on Terror. That is a very broad definition which can be applied to anyone the gov’t wants. I am to a point where I a worried about sharing my feelings like I am now because it is obvious that history is repeating itself. So again am I the only one that is seeing this? I have been studying WWII history for the past 10 years. Every time I turn on the news I am alarmed by the parallels of the past that so few know about because they are more concerned about American Idol than learning from the past. They just follow the herd. As many were in disbelief of the absolute totalitarian control that occurred in Germany, something of a similar nature could occur in America? America is not immune to social unrest, dictoral control helped along by social unrest and the collapse of the dollar that had been in the making for many years. Also the Posse Comitatus Act of 1878 has now be nullified by the H.R. 5122: John Warner National Defense Authorization Act in 2007. So this means that the president can now call out the Army, Navy, Marines and Air Force as a policing roll that the Posse Comitatus Act of 1878 restricted only to the National Guard. So there are your “Brown Shirts” all ready to go and they don’t need to declare martial law anymore but instead a nation emergency is all that is needed. Martial law is when the military takes over control. A national emergency is where the gov’t stays in control in coordinates or controls the military plans. Additionally, I looked up the gov’t web sites, found out that the US tax revenues are only 2.5 trillion a year. The cost to run the gov’t in 2008 was 500 billion a year. Now in two years time it has grown to 1.5 trillion a year. This leaves only 1 trillion for national defense, infrastructure repair and all the entitlement programs that have grown since the FDR years. So now we need to borrow 2 trillion dollars a year instead of one trillion, thanks to the Healthcare bill an extra trillion needs to be borrowed, just to barely keep things going as they are. This is unsustainable. Now with the developing countries such as China, India, Brazil, etc. the competition for the limited supply of oil in the world, now that peek oil has passed, will only create more friction between all countries. Just as the downturns in weather that caused food shortages over the thousands of years coincide with the outbreak of wars and the rise and fall of empires and nations the same goes for the natural resources a country needs to survive. All the pieces are in place. We are all in for a world of hurt over the next 10 to 20 years if history repeats itself. If we look at the historical record, we find that the “welfare state” didn’t cause the crises in Ireland(housing bubble) nor Iceland(bank debt/deregulation in 2001) while Germany and France continue to have UNIVERSAL HEALTHCARE. Taxing the wealthy will continue to be an important measure in terms of funding. Interesting comparison between Swedish & Singapore models. By the time the majority of Americans come to their senses, it will be far too late. Mr Zorba is absolutely right. Industrialized countries are turning themselves into stagnated countries that every day are a smaller, less relevant part of the world. Keynes pseudoscience is the guiding light in that suicidal path. In a country like Sweden old people most of the time are a burden on the youth, they must be sustained in old age by taxes paid the youth, that is how their social security works. They have little money to inherit to loved ones, they are rather poor and dependent of politicians and youth instead of being rich and free. In a country like Singapore social security is essentially through saving accounts: You save and invest to sustain yourself in old age. That investment creates jobs. That investment creates growth and higher wages to workers. Old singaporeans tend to be free people that depend on themselves and that have some money to inherit to the loved ones. They are not dependent on bureucrats and politicians decisions, they are not a burden on the youth. Singapore was dirt poor in the 1960s. It choose small government. It choose to ignore the recommendations by the macroeconomic “geniuses'”, nobel prize winners and other academics and bureaucrats. It choose freedom and prosperity and not serfdom under a political class. Today Singapure GDP production (in PPP dollars, the measure that makes sense) is much higher than Sweden’s production. Sweden was the super rich boy of the 1960s, along with the USA and others. But they choose being the serfs of a political class and we know the results. Dirt poor Singapore is now richer. The enormous lead that Sweden had over Singapore simply evaporated, because Sweden followed the counsel by all those keynesian macroeconomic “geniuses” and horribly damaged its growth and freedom. The welfare state is a failure. As times goes by it will be totally obvious. Why didn’t the mainstream media pick this up hardly at all? This is seriously interesting news. You’d think CNN & gang should crawl all over this one. Then like the next day a TERROR ALERT comes out for Europe. No news about the riots, just the alert. Is this like trying to pacify people by putting out the terror boogeyman? Trying to cover up reality and keep people focused on the phony recovery? And I bet that Mr. Mitchell’s purple line does not even take into account a variation of his very own “Mitchell law”: I.e. The fact that once voters start hurting, they will vote for even more central planning and redistribution. The resulting vicious cycle is likely to accelerate the actual trend and bring the day of reckoning much sooner than even the purple line implies. The fact that American voters voted for Obama in an effort to rectify Bush’s policies is perhaps the best indicator that the vicious cycle implied in “Mitchell’s law” has already begun. Things move fast in the 21st century. While 2.5 billion people in the BRIC countries (Brasil, Russia, India China) have finally started modest copying of western supply side economic liberalization, the 1 billion people of the West (US and Europe) are reverting to the failed central planning and redistribution policies that once kept the BRIC countries in misery. Good luck! Convergence (which implies economic marginalization of the West) will come much sooner than most Westerners anticipate. Don’t worry, big-city, Democrat controlled cities will do all the pension-cutting and laying-off of gov’t employees when Repubs are in power, and blame them for it. richard40 — Your analysis is excellent, to the point it rendered your opening sentence moot. Neither the U.S. political class nor the U.S. electorate has the will or capacity to address problems until they’ve reached “crisis” status. 9/11, Katrina, and the housing implosion proved that beyond a reasonable doubt. Bottom line, the biggest financial cramdowns in history are on the way. The only question is when. Can we make the linked item required reading? It’s a longish post regarding Davey Crockett and welfare. If only his wisdom had ruled us. The suburbs will be like the settlements on the edge of the forests in the French& Indian wars. Time to sound out your neighbors. I will be convinced that the US will avoid fiscal crisis when, the next time a dem cries that their repub opponent is cutting social security or medicare, the repub, instead of loudly denying it, can reply, “yes, modest cuts in those programs might be necessary to avoid fiscal crisis, and ensure they dont go completely bankrupt”. The problem now is if any repub is actually honest enough to do that, the AARP and the seniors vote them out. We can’t blame this crisis just on our politicians. Until the voting public finally gives their votes to politicos who actually propose real cuts, not just vague cosmetic ones, and votes out any politoco who proposes any new entitlement, things wont change. The first test I see on the horizon is whether Obamacare will ever be repealed. If it is, their is hope for continued real change. If not, put your money into gold, and prepare to find some non-socialsit country to move to. If Obamacare is ever repealed, the second candidate would be the Bush era drug benefit program. Then things like the dept of education, energy, HUD, agriculture, etc. The problem though is too many voters want government cut in the abstract, but if anybody tries to cut any program they happen to like, then all hell breaks loose. We can’t just blame the politicos, we ourselves are to blame as well. You can’t get something for nothing. And the particular government service that you most like, is to other eyes the same as the pork that you hate. Once it was granted that the parasites’ seizure of property had any kind of moral legitimacy, we lost the war. Quibbling over quantity and manner of use afterwards is just negotiating with the executioner about whether you want to die quickly and painfully or die slowly and painfully. If the US weren’t a country that seemed to group so-called “tax evaders” along with child molesters and the like, I might have had some hope for it surviving the next couple of decades. I have a hard time believing that all the people who have shown that they were just fine with the mis-definition of “income”, redistribution of wealth, taxation as a tool of social manipulation, and SOP persecution of “tax evaders” over the decades are suddenly going to whip out a gun and defend themselves against the people who, at this point, justly think that the value producers have acknowledged the right to seize their property if anyone expresses a “need”. That’s the plan anyway. Seems more likely that we will have ballot by bullet way before then anyway. Until we systematically cull the professional politicians from our government and institute citizen politicians who serve briefly and return to the private sector, likely nothing will improve markedly. 1. Those with meaningful savings realize that the West is no longer the only game in town. 2. The disaster of the subprime meltdown has forced the investing class to recognize that their governments can only be counted on to confiscate and squander increasing proportions of their wealth. As a result, savers are beginning to make the collective decision to concentrate on protecting the wealth they already have. In doing so, the economy and those who rely on continued coercive redistribution are being gently strangled. A promise made by law, nothing more. However, when the law claims to do more than dispense justice, by instead dispensing property, it steps too far and makes promises that it can’t keep in the long term, as this post shows. While it’s possible to extract 60% of the money from the economy, the collapse that would cause would result in very little revenue for the government. It’s probably not possible to extract an amount (dollar amount) equivalent to 60% of today’s GDP. The rioting will only be bad for those on the side of the statists trying to unjustly confiscate our property. It will be fairly safe for everyone else BECAUSE our citizens will be able to defend themselves from the statists, and we’ll greatly outnumber the other side. Where di the term “entitlement” come from? I was always taught that you work hard and make something of yourself. I did not always have a job that I wanted or liked, but I went to work every day and did my job until the opportunity presented itself for me to better myself. The only entitlement that you have in this great country of our is to work and make something of yourself. It is not my job to provide for you! When the police riot in the US they will be a small minority of the armed citizens. Behoves them to be polite. “limit the growth of government” is akin to “slow the progress of the nuclear chain reaction”. A stark reduction in the size of government is necessary. In a country with a Second Amendment and hundreds of millions of firearms distributed among the citizenry, any future rioting won’t be as bad as that seen in Europe. It’ll be far, far WORSE. In other words, any politican who promises entitlements is lying through his teeth. There will be no money to pay for Social Security, Medicare, etc. Its time to break out the tar and feathers, make a few object lessons. on September 30, 2010 at 1:23 pm Instapundit » Blog Archive » DAN MITCHELL: Europe’s Riots, America’s Future….